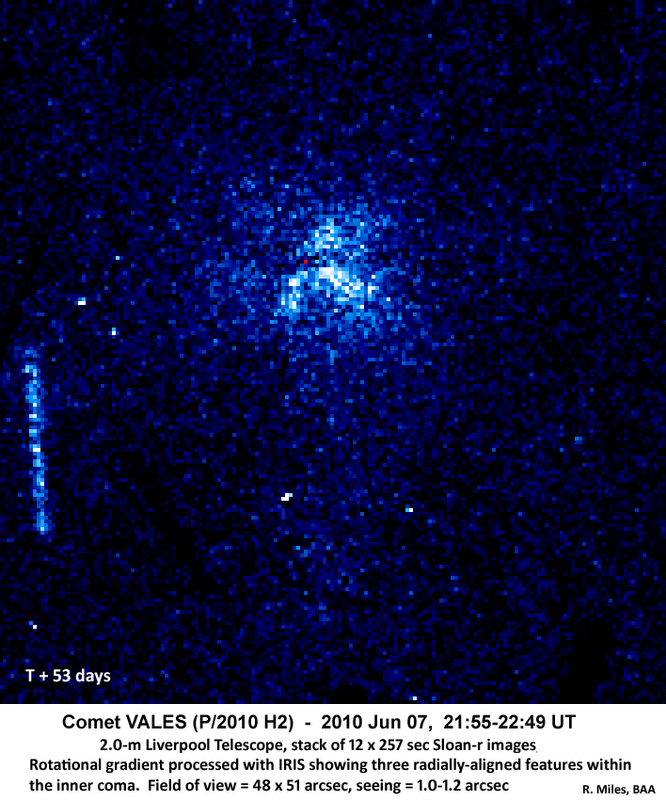 Images and animations of comet P/2010 H2 (Vales), obtained by other observers worldwide. They are published with permission of their authors. Page prepared by J. Vales. 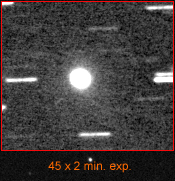 Unfiltered image of comet P/2010 H2 (Vales), obtained by Ernesto Guido & Giovanni Sostero on April 16.42 with 0.25m, f3.4 reflector. Image was stacked with 6 unfiltered images of 120-second exposure. 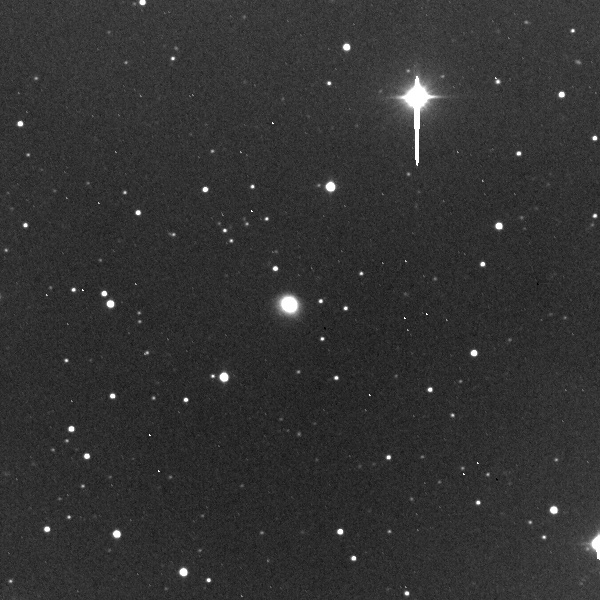 It shows that this object has an FWHM consistently wider than the nearby field stars of similar brightness. An additional stacking of 6 unfiltered exposures, 30-sec each, obtained through the same instrumentation on 2010 Apr. 16.43, confirm this evidence. Copyright © 2010 by Ernesto Guido & Giovanni Sostero. Images below were taken by Alain Maury on April 17 with C14 f1.96 (hyperstar focus), QHY9 unfiltered camera, 1.6" per pixel scale. He stacked 60 images, each with 60 second exposures. Here is an image of the object, stack recentered on the object. Copyright © 2010 by Alain Maury. Image with a very high contrast rendition. I can clearly state that there is a faint coma around the object. The coma is about 50 pixels large, therefore about 1.3 arc minute wide. Copyright © 2010 by Alain Maury. 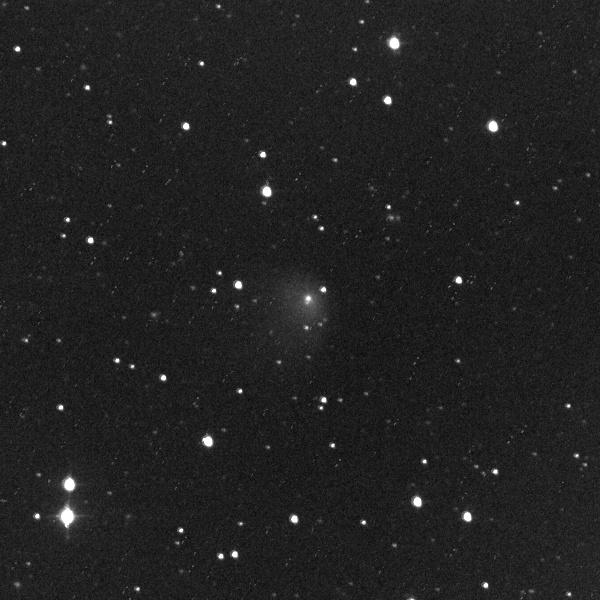 Image of comet P/2010 H2 (Vales), taken by Bernhard Haeusler on April 17 with 0.30-m f5.65 Schmidt-Cassegrain telescope. He stacked 21 images, each with 60 second exposures. Copyright © 2010 by Bernhard Haeusler. 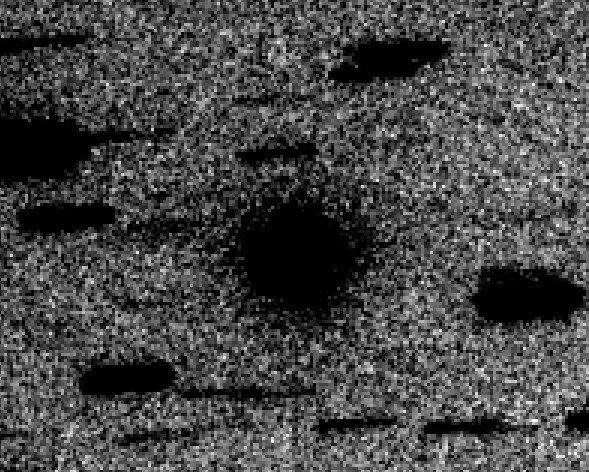 Animation of comet P/2010 H2 motion, made by Bernhard Haeusler. Copyright © 2010 by Bernhard Haeusler. 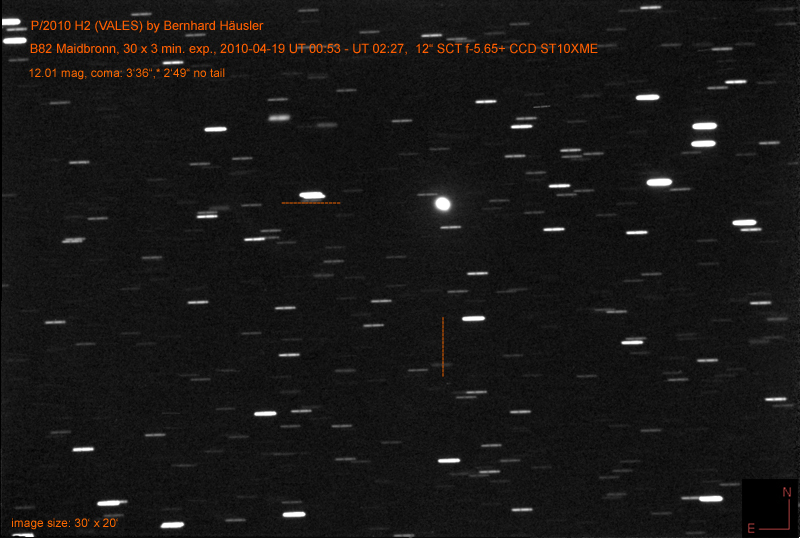 Image was obtained by Simon Krulec on April 17 at 1.58LT with 0.20-m f4,5 Newton telescope and Canon 450d & HEQ5. Exposure time was 300 second . Copyright © 2010 by Simon Krulec. 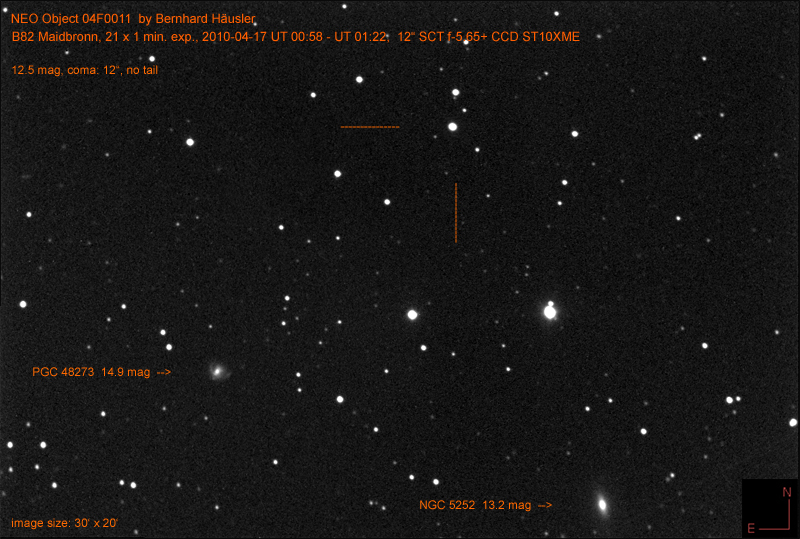 Images below were obtained by Bernhard Haeusler on April 18 with 0.30-m f5.65 Schmidt-Cassegrain telescope. Exposure time was 120s. Copyright © 2010 by Bernhard Haeusler. 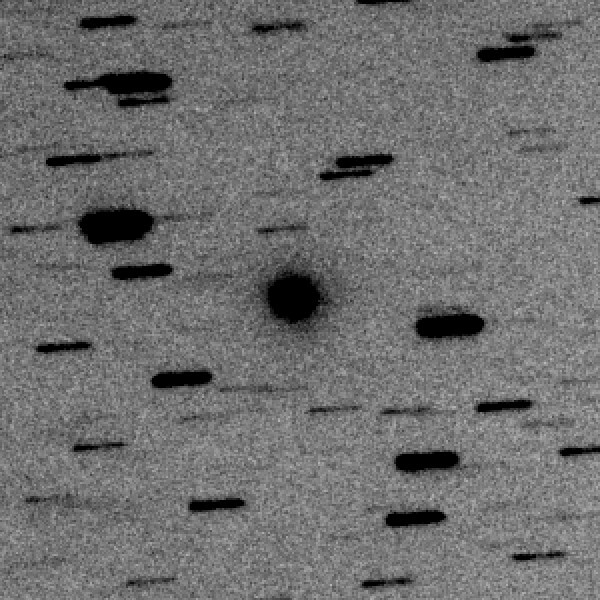 21 x 2 minutes gif animation of comet P/2010 H2 (Vales) from UT00:54 to UT01:38, made by Bernhard Haeusler on April 18. Copyright © 2010 by Bernhard Haeusler. 45 x 2 min. exposure, 2010-04-18 UT 00:52 to UT02:36. Copyright © 2010 by Bernhard Haeusler. 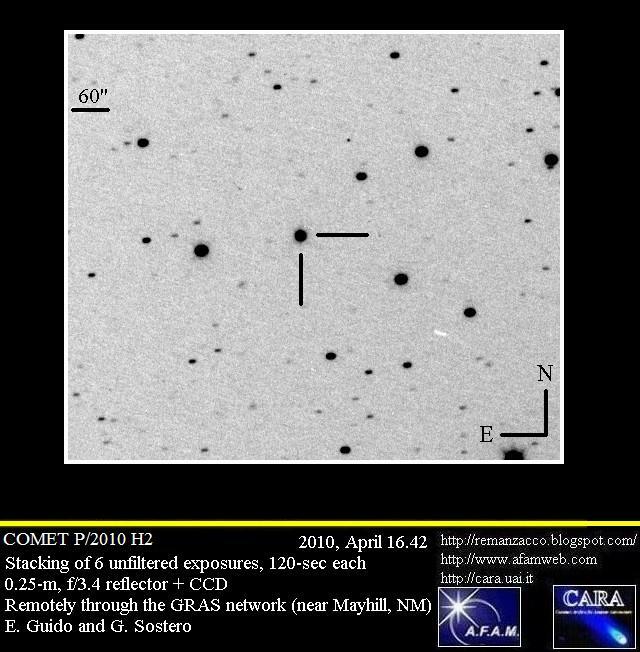 Image of comet P/2010 H2 (Vales), obtained by Ernesto Guido & Giovanni Sostero on April 18.90 with 0.25m, f3.4 reflector. They stacked 15 images, each with 180 second exposure. Copyright © 2010 by Ernesto Guido & Giovanni Sostero. 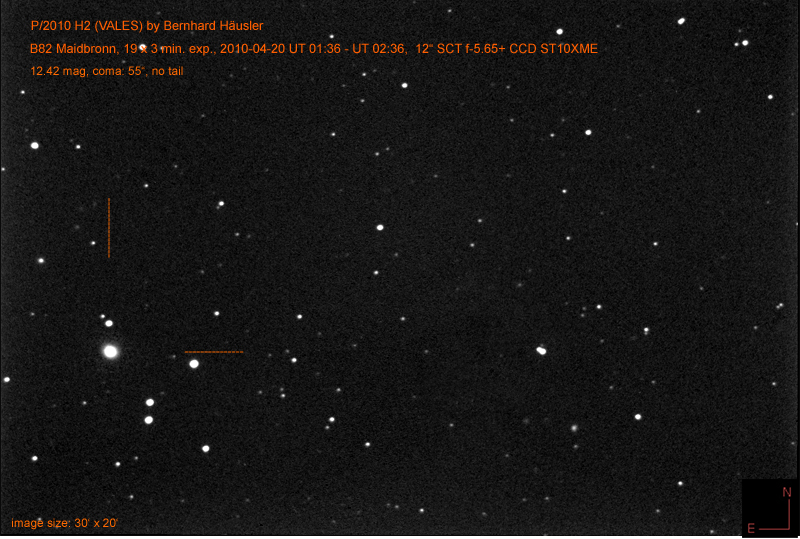 Images below were obtained by Bernhard Haeusler on April 19 with 0.30-m f5.65 Schmidt-Cassegrain telescope. He stacked 30 images, each with 180 second exposures. Copyright © 2010 by Bernhard Haeusler. 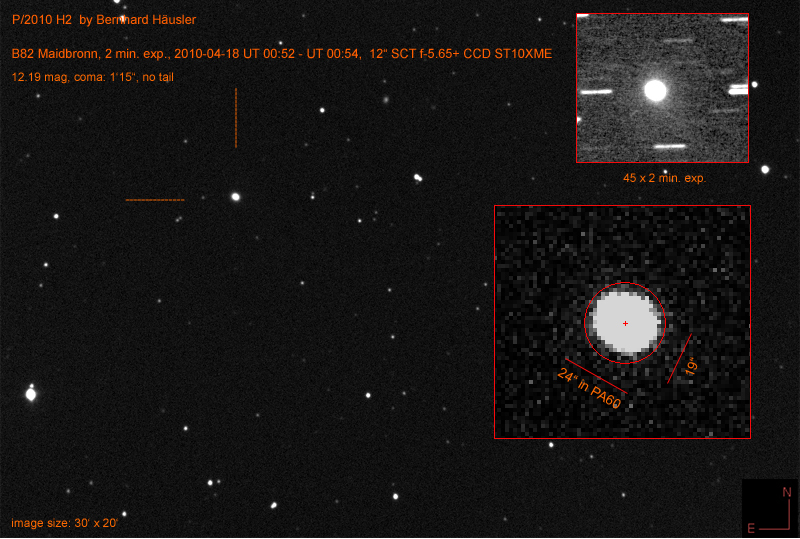 Images below were obtained by Bernhard Haeusler on April 19 with 0.30-m f5.65 Schmidt-Cassegrain telescope. He stacked 30 images, each with 180 second exposures. Images are frozen on a comet. Copyright © 2010 by Bernhard Haeusler. 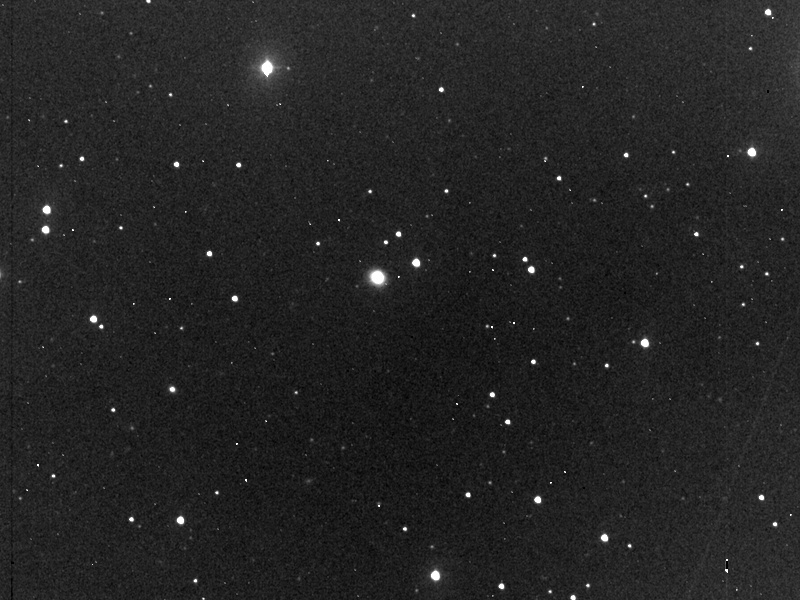 Images below were obtained by Bernhard Haeusler on April 20 with 0.30-m f5.65 Schmidt-Cassegrain telescope. He stacked 19 images, each with 180 second exposures. Copyright © 2010 by Bernhard Haeusler. 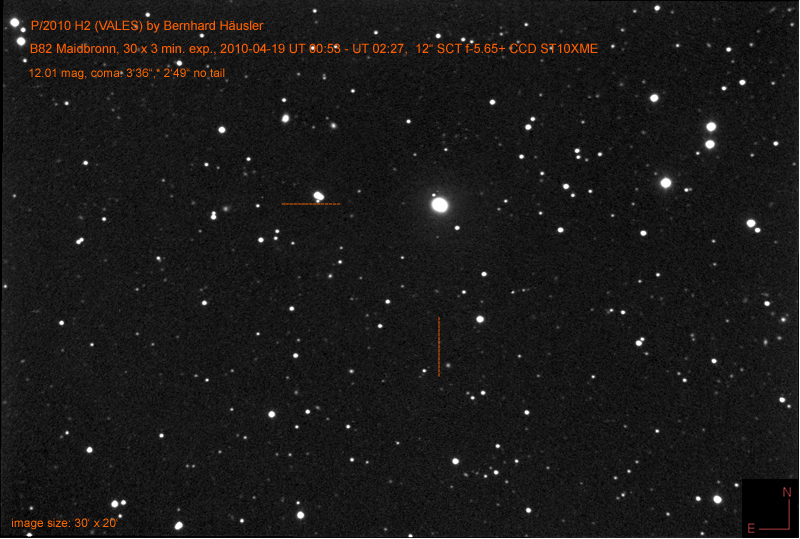 Images were obtained by Simon Krulec on April 20 at 1.34-1.49UT with 0.20-m f4,5 Newton telescope and Canon 450d & HEQ5. He stacked 3 images, each with 300 second exposures. Copyright © 2010 by Simon Krulec. 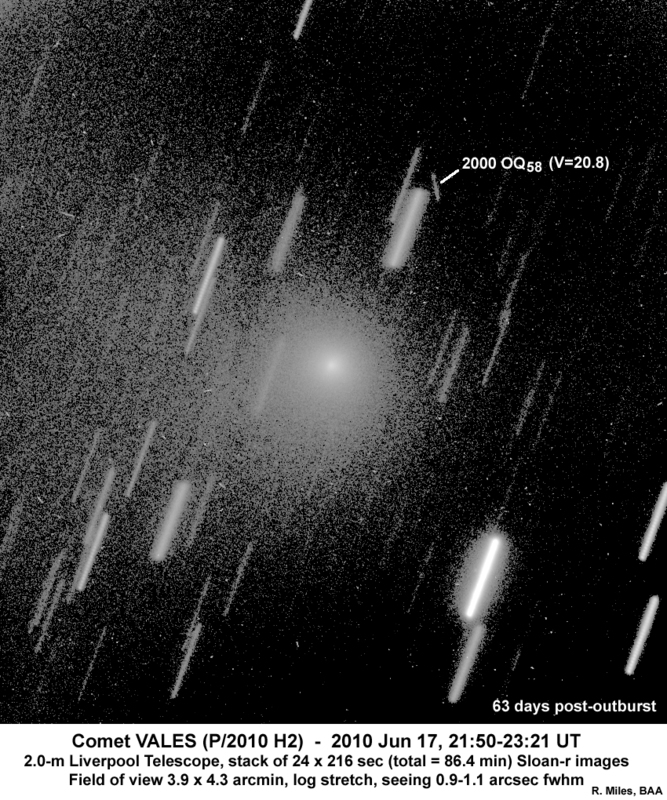 Image of comet P/2010 H2 (Vales), obtained by Javor Kac on April 20 with Rezman II telescope. He stacked 3 images, each with 90 second exposure. Copyright © 2010 by Javor Kac. 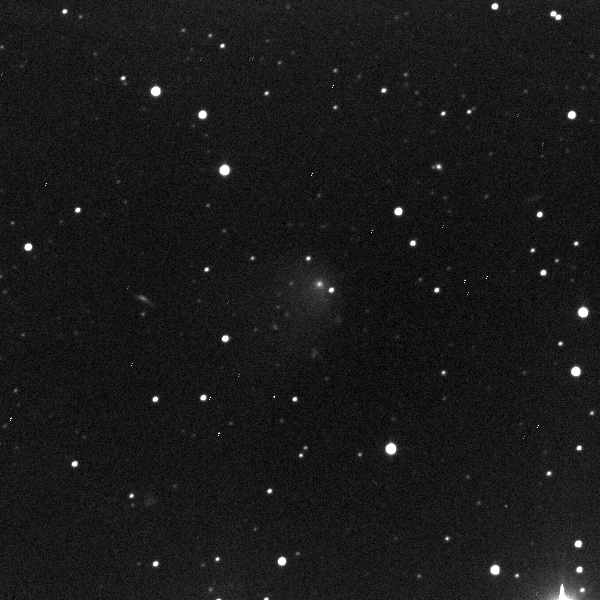 Image of comet P/2010 H2 (Vales), obtained by Javor Kac on April 21 with Rezman II telescope. He stacked 3 images, each with 90 second exposure. Copyright © 2010 by Javor Kac. 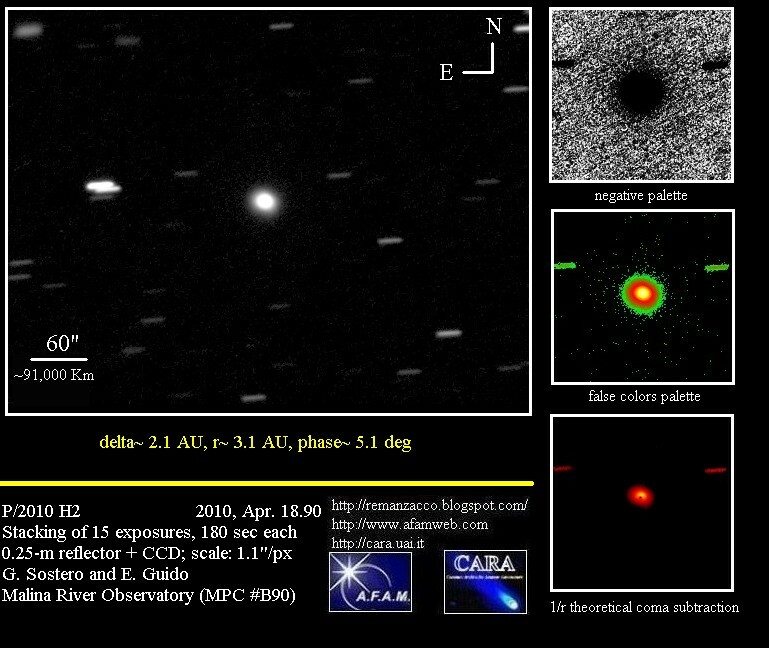 Image of comet P/2010 H2 (Vales), obtained by Javor Kac on April 29 with Rezman II telescope. He stacked 9 images, each with 90 second exposure. Copyright © 2010 by Javor Kac. Image of comet P/2010 H2 (Vales), obtained by Ernesto Guido & Giovanni Sostero on May 4.35 with 0.25m, f3.4 reflector. They stacked 9 images, each with 60 second exposure. Copyright © 2010 by Ernesto Guido & Giovanni Sostero. 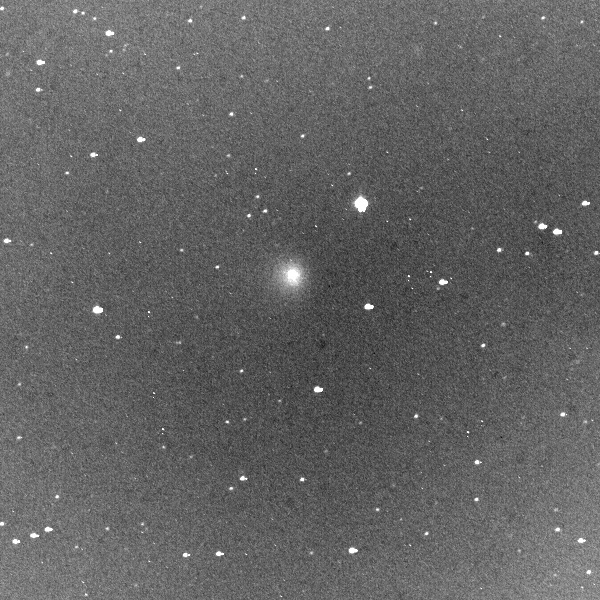 Image of comet P/2010 H2 (Vales), obtained by Chris Schur on May 5 with 0.20m, f4 Newtonian telescope Astrograph with w/Baader MPCC Coma Corrector. He stacked 6 images, each with 300 second exposure and processed with Photoshop CS2, Images Plus 3.82. Copyright © 2010 by Chris Schur. 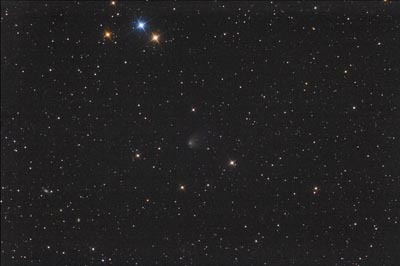 Image of comet P/2010 H2 (Vales), obtained by Richard Miles on May 10 with 2m, Faulkes Telescope South. He stacked 19 images, each with 120 second exposure, using Sloan-r filter. Copyright © 2010 by Richard Miles. 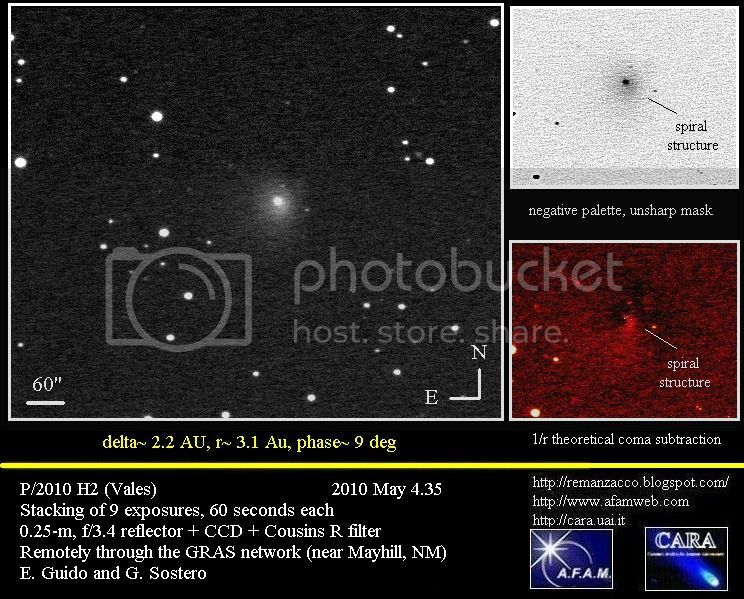 Evolutin of spiral structures within the coma of comet P/2010 H2 (Vales) in the period from April 30.4 to May 10.5. Images were obtained by Richard Miles with 2m, Faulkes Telescope South, using Sloan-r filter. Images were processed in IRIS. Copyright © 2010 by Richard Miles. 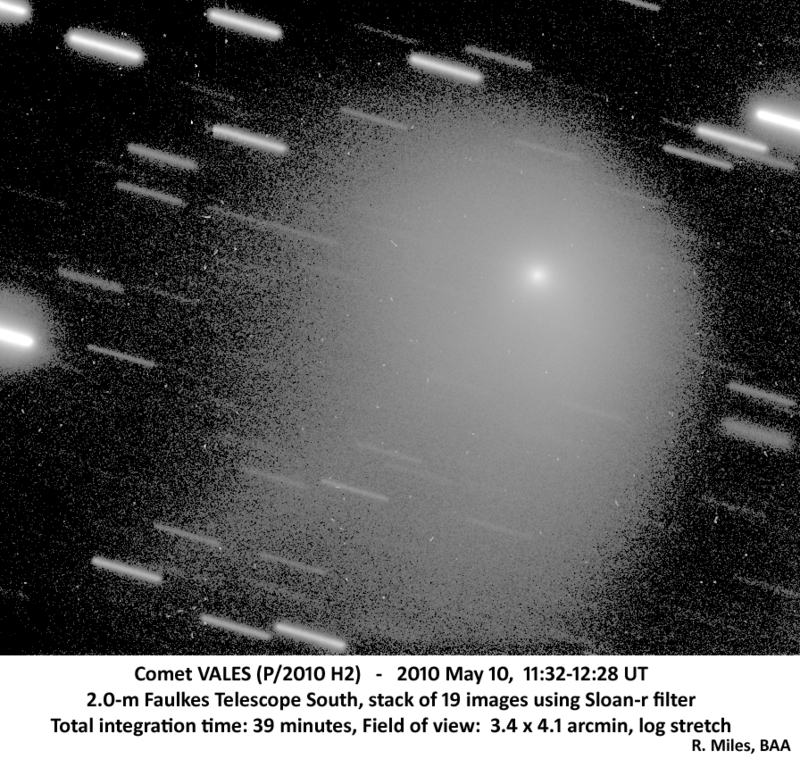 Image of comet P/2010 H2 (Vales), obtained by Javor Kac on May 12 with Rezman II telescope. He stacked 5 images, each with 90 second exposure. Copyright © 2010 by Javor Kac. 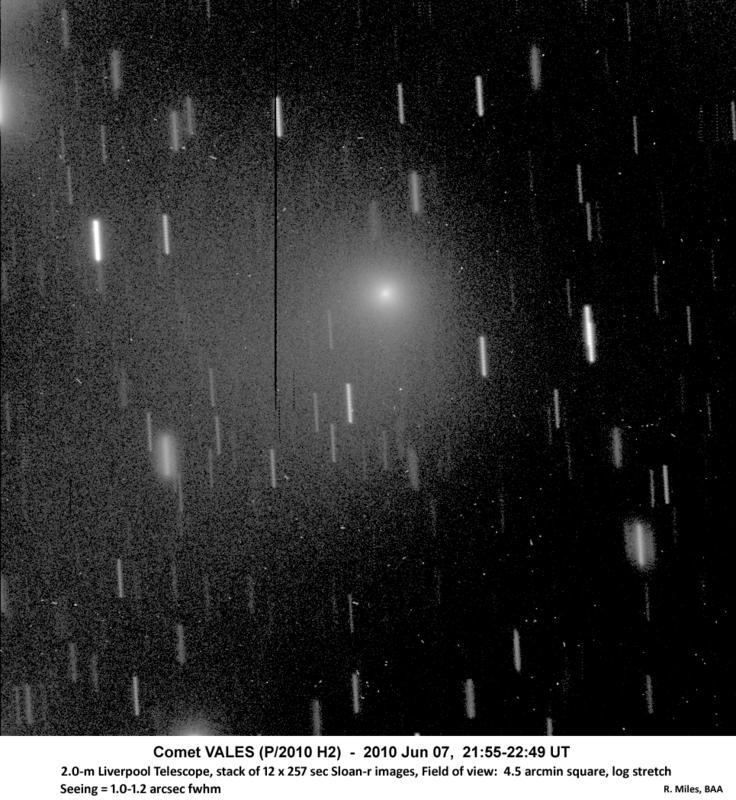 Image of comet P/2010 H2 (Vales), obtained by Javor Kac on May 13 with Rezman II telescope. He stacked 6 images, each with 90 second exposure. Copyright © 2010 by Javor Kac. 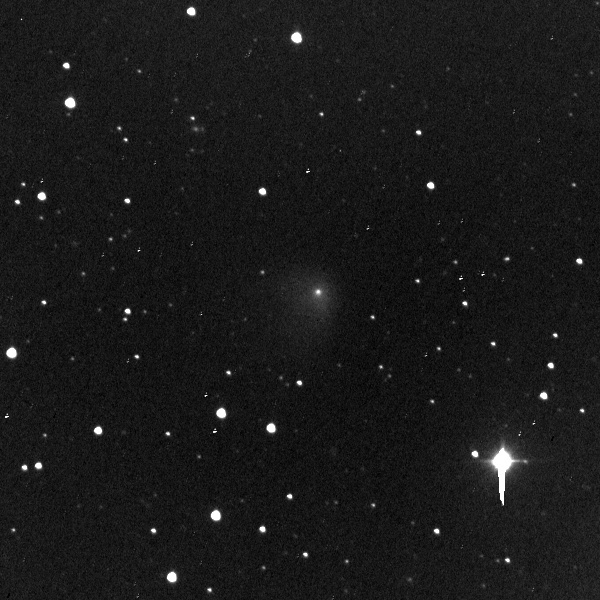 Image of comet P/2010 H2 (Vales), obtained by Javor Kac on May 18 with Rezman II telescope. He stacked 2 images, each with 90 second exposure. Copyright © 2010 by Javor Kac. 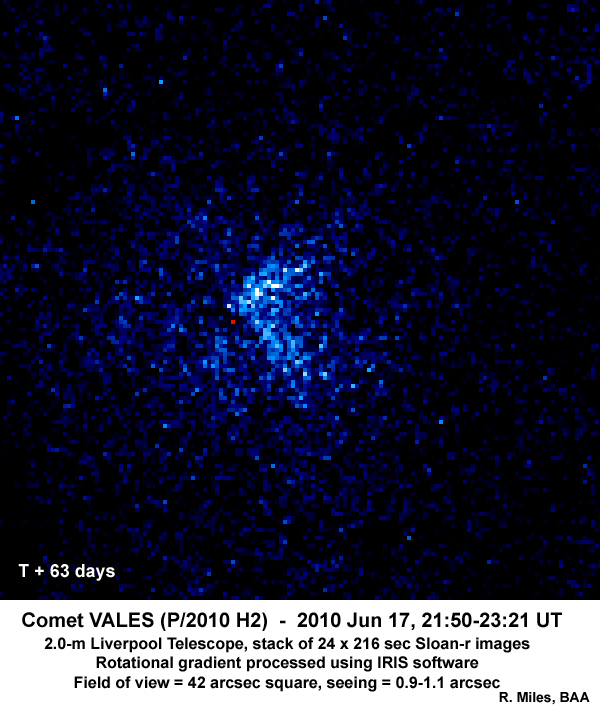 Image of comet P/2010 H2 (Vales), obtained by Richard Miles on Jun 6 with 2m, Liverpool Telescope. He stacked 10 images, each with 260 second exposure, using Sloan-r filter. Copyright © 2010 by Richard Miles. 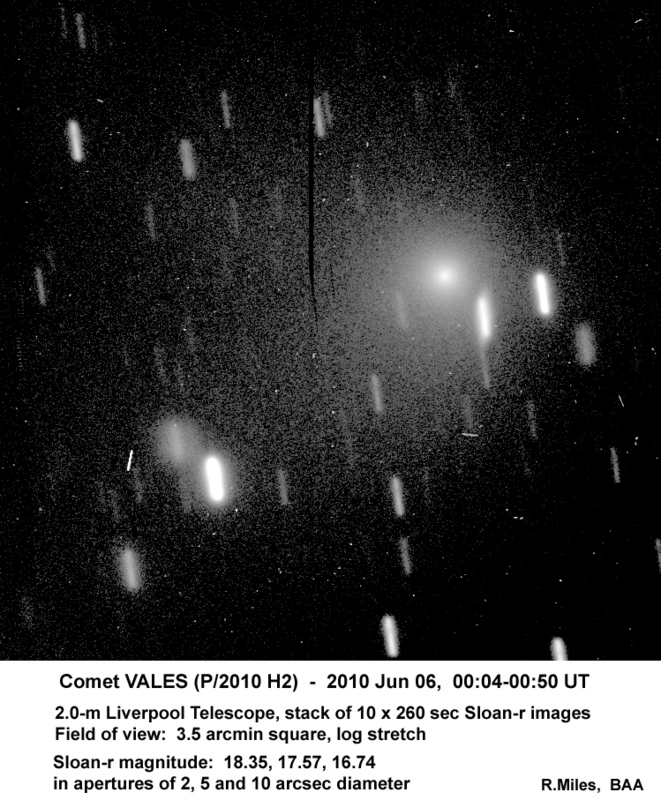 Image of comet P/2010 H2 (Vales), obtained by Richard Miles on Jun 7 with 2m, Liverpool Telescope. He stacked 12 images, each with 257 second exposure, using Sloan-r filter. Copyright © 2010 by Richard Miles. 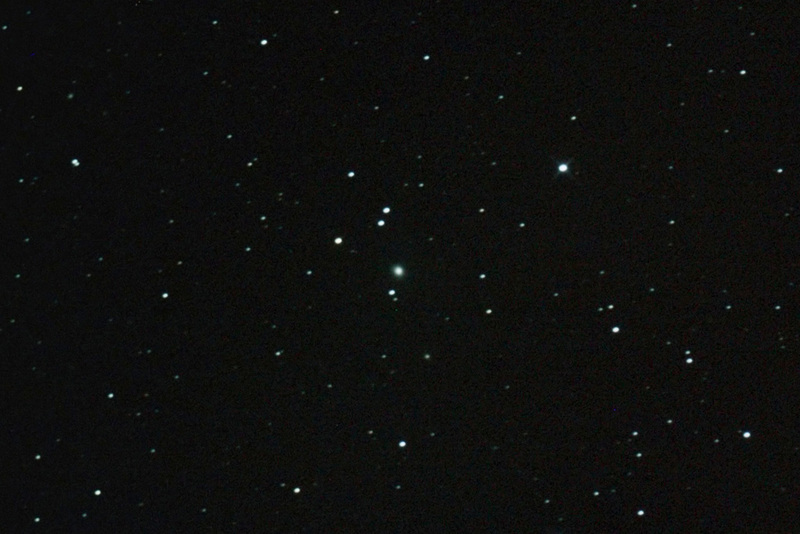 Image of comet P/2010 H2 (Vales), obtained by Richard Miles on Jun 7 with 2m, Liverpool Telescope. He stacked 12 images, each with 257 second exposure, using Sloan-r filter. Images were processed in IRIS. Copyright © 2010 by Richard Miles. 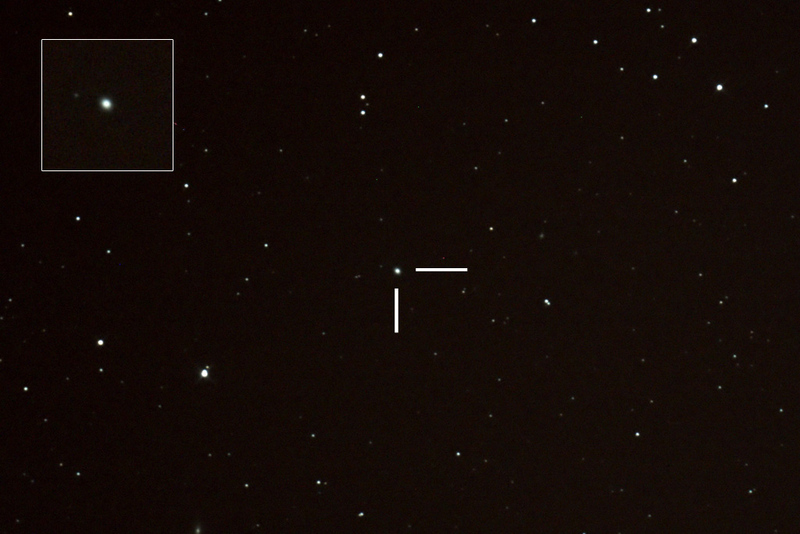 Image of comet P/2010 H2 (Vales), obtained by Richard Miles on Jun 17 with 2m, Liverpool Telescope. He stacked 24 images, each with 216 second exposure, using Sloan-r filter. Copyright © 2010 by Richard Miles. 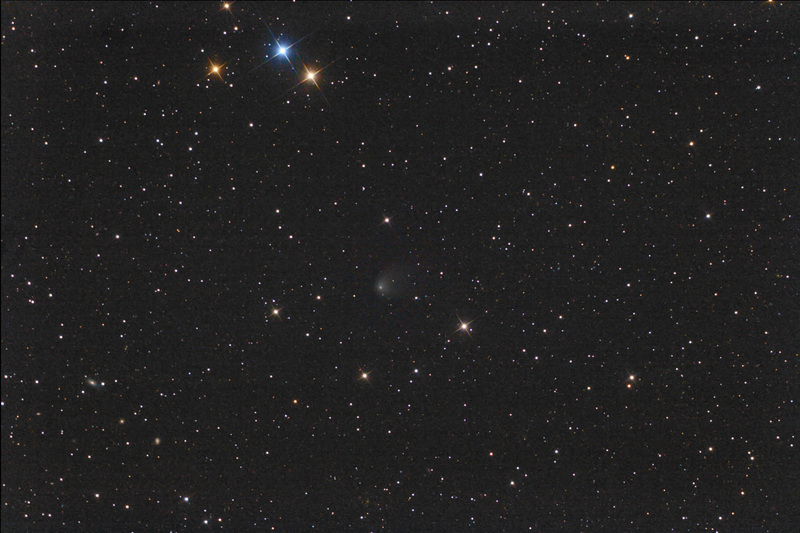 Image of comet P/2010 H2 (Vales), obtained by Richard Miles on Jun 17 with 2m, Liverpool Telescope. He stacked 24 images, each with 216 second exposure, using Sloan-r filter. Images were processed in IRIS. Copyright © 2010 by Richard Miles.